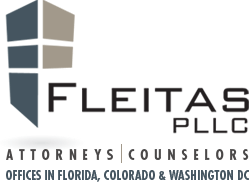 FLEITAS PLLC is a law firm dedicated to developing lasting relationships with clients whose focus is on business, real estate and immigration law. Our Miami-based law firm promotes an environment of client-access, where our clients benefit from direct communication (from concept to completion) with seasoned business, banking, real estate, construction and immigration professionals. The attorney-client relationships we foster increase the effectiveness of our representation and allow us to zealously advocate on matters of interest to our clients. South Florida, and in particular Miami-Dade County, is a strategic destination for our target practice areas, which drive both the local and international marketplaces. As the primary drivers of growth in South Florida, and in particular Miami-Dade County, our Firm is committed to being at the forefront of South Florida’s, booming business, banking, real estate and construction industries. To this end, we provide personalized, well-thought-out and trusted strategies, including immigration strategies, for our clients, which in turn lead to long-lasting relationships that enable us to further cater to our clients’ business and real estate legal needs. Our Transactional Business Practice makes sure our clients are attuned to current trends in the marketplace, and provides cutting-edge counsel to clients across all prevalent business segments in South Florida. Our Miami attorneys core strengths include: Business Finance; Entity Formation and Document Drafting; Joint ventures; Limited Liability Companies, Corporations and Partnerships; Mergers and acquisitions; and Private Placements. If you are a transactional business lawyer in Miami, you need to be accustomed to dealing with Latin America. Our transactional business lawyers are multicultural and trilingual, essential attributes for handling business transactions in Miami. Our Miami transactional business lawyers understand the cultures and legal systems that are at play in cross-border business transactions. Our Transactional Real Estate Practice focuses on providing comprehensive legal counsel and advice on a wide array of real estate investments in South Florida. Our attorneys are well-versed in navigating and negotiating real estate transactions across all cross-sections of the real estate industry in Miami-Dade County, including: Contract Drafting and Negotiation; Commercial and Residential Real Estate Finance; Commercial and Residential Real Estate Acquisition; Commercial and Residential Real Estate Development; Commercial and Residential Real Estate Disposition; Commercial, Residential, Retail, Office, Industrial, Restaurant and Shopping Center Leasing and Strategy; Developer Representation; Land Trusts; Title Insurance; as well as Workouts and Asset Repositioning. Miami real estate is an ever-evolving industry. In response to the changing legal needs of Miami property owners and investors, our Firm offers cutting-edge advice where real estate is at the center of the transaction. Our Immigration Practice employs a comprehensive approach to legal representation, focused on assisting international entrepreneurs, business owners, investors, and businesses of all sizes in attaining not only their immigration goals, but to further provide them with trusted and proven legal services in the areas of business, real estate, banking, and construction law. Even though our firm’s immigration practice primarily focuses on business immigrations strategies and services, we can assist clients with both immigrant and nonimmigrant visa petitions, employment-based petitions and family-based petitions. Some of our most sought-out immigration services include: E-1, E-2, L-1A, L-1B, O-1, H-1B, B, and K visas. Nonetheless, we also assist clients with residency (green card) petitions, citizenship and naturalization services, asylum, and an array of other immigration services. In preparing any kind of immigration case or petition, our mission is to provide individualized attention to each client, ensuring that every case and petition are diligently prepared to maximize their probability of success. As a boutique law firm, we are passionate about helping small businesses thrive. Every entity begins as a start‐up, and we know that (especially at the beginning) every dollar counts. That is why at FLEITAS PLLC we pride ourselves on being practical and effective. Established businesses have been around the block, and can always hire larger format law firms to handle their business needs. Our clients, however, understand that the size of our Firm gives us the flexibility to assign smaller transaction teams which, in turn, allow our final bills to be substantially less than our larger counter-parts. Our Miami law office has a small-firm platform, which enables us to offer swift, cost-efficient advice to clients. This streamlined approach to legal representation, promotes our client-access model and provides for legal representation that is much more cost-effective. Our clients come from all over the world, but the common thread among them is the desire to have a Miami lawyer that is accessible. At FLEITAS PLLC talented and accomplished Miami-based lawyers and staff are committed to our client-access model. When retaining FLEITAS PLLC you get an indispensable legal resource in Miami-Dade County, Florida that is available to you when you need it. We take the time to get to know our clients, and we take pride in understanding both their business and personal needs. Whether it is our transactional business lawyers, our transactional real estate lawyers, or our immigration lawyers, our clients receive comprehensive legal representation from an attorney they can talk to, and who understands the full scope of their short-term objectives and long-term goals. Our team of international attorneys is fluent in English, Italian and Spanish. Aside from being well-established in the South Florida community, our attorneys have close ties to, and experience with, several international markets in both Latin-America and Europe. This experience provides an irreplaceable added-on value to international clients seeking to enter the United States market, and to American companies seeking to enter foreign markets. Above all, our Firm’s goal is to obtain results for our clients. We take the time to thoroughly understand our clients’ legal needs. Whether it is our immigration, business, or real estate services, our clients receive comprehensive legal representation from a team of attorneys and legal professionals, who are always available to talk to their clients, and who understand the full scope of their short-term and long-term objectives.